Make Your Tactical Event a Success! Home » Blog » Blog » Make Your Tactical Event a Success! 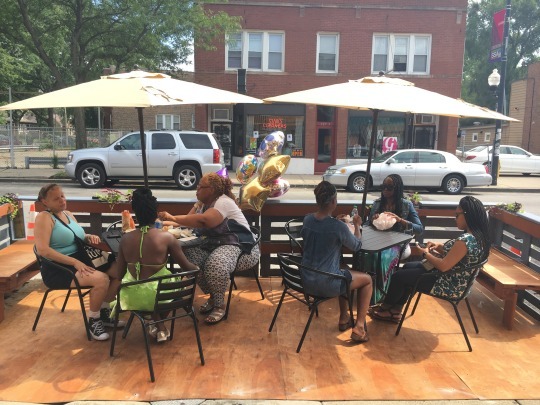 This summer, Farr Associates worked with Chicago’s Chatham neighborhood testing ideas on how communities can kickstart economic development with tactical projects and pop-up events. Chicago’s 6th Ward Alderman Roderick Sawyer had a challenge: The middle-class families in his Chatham neighborhood weren’t frequenting neighborhood establishments, electing instead to shop and dine in Hyde Park or the north side. While he understood the long-term value of planned commercial district design guidelines, he wanted to know if his community could see progress even faster. A working partnership formed between Farr Associates and the City of Chicago Department of Planning and Development. The proposal? Let’s try a tactical approach of placing parklets and seating in front of local businesses to activate 75th street. An event called “Dining on the 5” took shape for the weekend of July 21-23. The Greater Chatham Initiative stepped in with key support, and the event evolved into a festival with live music and $5 food specials from local eateries. Our team planned, designed, built, and secured permits for parklet structures, mobile planters, and outdoor seating areas for seven participating businesses. Hundreds of people attended over the weekend, with participating business owners reporting a sharp increase in sales. Based on the overwhelmingly positive response, the City agreed to extend the event’s permits through Labor Day. 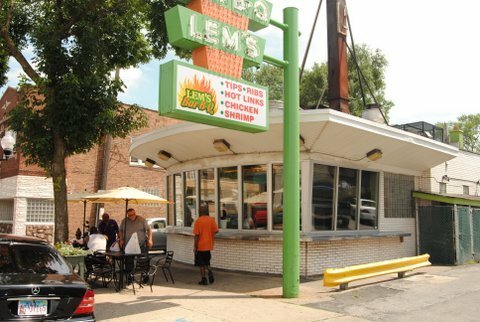 The next step is the City’s development of commercial district design guidelines, which will help enhance the visual appeal of the 75th Street, 79th Street, and Cottage Grove commercial corridors. 1. The Community Must Play a Key Leadership Role. For a successful event, there needs to be a non-profit/community organization to lead the effort locally and recruit reliable volunteers to help make the event a success. Planning should begin at least three months out from the event, with weekly, or bi-weekly coordination calls to ensure coordination and progress. 2. Local Businesses Must Enthusiastically Participate. Participating businesses need to do their own marketing outreach, provided with pre-made marketing materials from the planning team such as a logo, social media hashtags, and summary blurbs of what the event is about. Dining on the 5’s success was bolstered by the local businesses offering their own specials for event day to draw additional pedestrian traffic and boost sales. 3. Don’t be Scared to Forge Your Own Path. In the City of Chicago, as in many other places, there is no pre-established permitting process in place for a temporary pop-up event. Dining on the 5’s execution was made possible through extensive coordination with various City departments, including the 6th Ward Office, Chicago Police Department, and especially the Department of Transportation (CDOT), since most the event took place within the right-of-way– in on-street parking spaces and on the sidewalk. There was no playbook for this. We just made a lot of calls and kept calling. If possible, work with the DOT to refresh crosswalks and other pavement markings in the area before the event. (They typically will not permit volunteers to do this ‘tactically’ on their own). 4. Get the Word Out with an Exciting Story. Each neighborhood gets their news from different sources. Talk to local leaders and key figures in the community to better understand the best ways to reach the greater community. Work with the planning team to draft press releases to distribute to local news outlets – this way you are essentially handing them a pre-written story. Little effort on their part– huge impact on your ability to get the word out. 5. Tactical Inspiration is Everywhere! In Chatham, a process which started off as a series of public meetings to develop building design guidelines, quickly evolved into an exercise in Tactical Economic Development, embracing and amplifying the existing assets on 75th Street. Tactical events promoting creative design, vision, and new partnerships can help businesses and residents re-discover the vibrancy, flavors, and strengths of their own community.